We fully design and manufacture our customized system to suit new and existing sites. 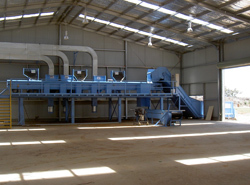 We have a large selection of machinery to manufacture anything is required by our clients. Welcome to the website of Britto's Engineering Pty Ltd.
Britto's Engineering provides all our customers a wide-range of services that are synonymous with unmatched quality and reliability. Britto's Engineering specialises in perfecting its product and providing prompt and professional service to our customers. Designed and Manufactured by Brittos Engineering 2003.